Wilson Sporting Goods is a leader in the sporting goods market, and their golf division has quite a reputation in the game. Golf great Arnold Palmer is one of the users of Wilson Golf products. The Chicago-area company has released a full line of best-selling men and women’s clubs. The Wilson Women’s Pro Staff 11 Piece Set offers players a club-only set that includes a driver, fairway woods, irons and hybrids for a seamless transition throughout the course. The entire set comes with graphite shafts for light, flexible clubs that are designed for a women’s swing. This matching club set with pink and silver accents looks striking on the course. Each club is fitted with an all-weather grip for stability and comfort. The hallmark of the set is the all-graphite shafts which are generally preferred by women for the light weight and flexibility. Wilson’s Pro Staff sets remain the best-selling sets in the market, and for good reason. The set continues to receive high reviews for its technology and versatility throughout the course. 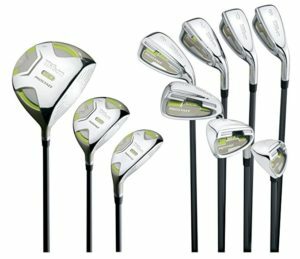 The range of clubs is easy enough to use for the beginner but also provides the ability for growth with the set.